In small bowl, combine olive oil, gingerroot and garlic; mix well. Place chicken in large shallow dish. Brush garlic mixture over chicken, coating all sides. Sprinkle chicken with salt and pepper. Let stand at room temperature for 15 minutes to marinate. Meanwhile, heat grill. In small bowl, combine marmalade, orange juice and sesame oil; mix well. When ready to grill, place chicken on gas grill over medium heat or on charcoal grill 4 to 6 inches from medium coals. Cook 25 to 30 minutes or until chicken is fork-tender and juices run clear, turning and brushing frequently with marmalade mixture during last 15 minutes of cooking time. Place orange slices on grill during last 5 to 8 minutes of cooking time; turn once. 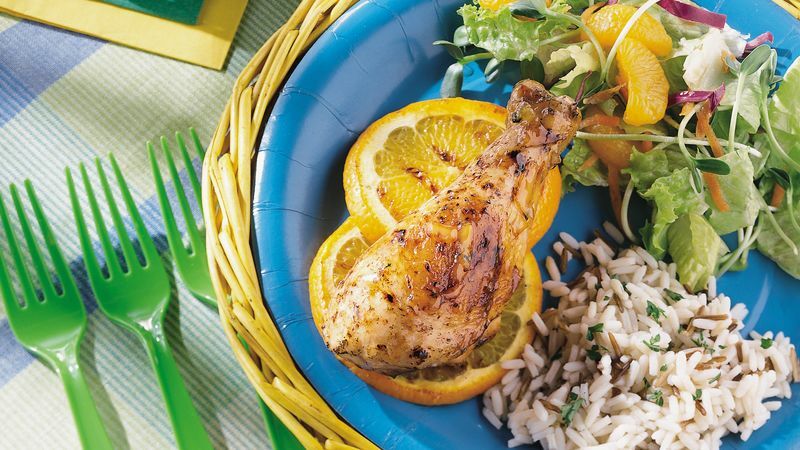 Serve chicken over orange slices. To broil chicken, place on broiler pan; broil 4 to 6 inches from heat using times above as a guide, turning and brushing frequently with glaze during last 15 minutes of cooking time. Gingerroot is a knobby root covered with tan skin. Purchase gingerroot with smooth skin, indicating its freshness. Peel the skin before using it. Wrap and refrigerate the unused portion for up to a week or freeze for up to 2 months. Dark sesame oil is available in the Asian food section of the supermarket. It iparts a deep rich flavor, stronger than light sesame oil. Substitute four chicken breast halves for the cut-up frying chicken.